The Chonnam Tribune has provided information about Korean traditional crafts and craft-work experiences such as Chaesang, Jjokyeomsaek, and Onggi from the March issue this year. – Ed. Gangjin-gun, famous for its kiln sites of Goryeo celadon, hosts an annual celadon festival every year in summer. 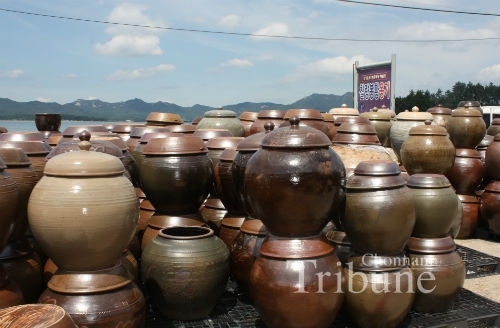 When a Tribune reporter visited the festival on August 2, many people were enjoying the vibe by taking part in activities including making onggi, traditional Korean earthenware. 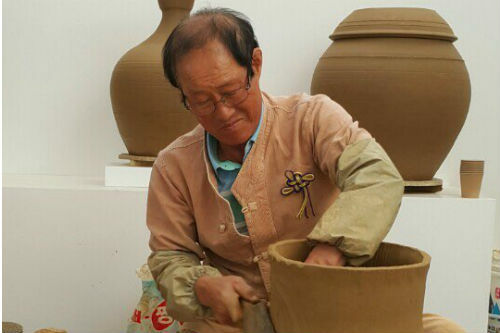 After passing by various booths, the reporter met Onggijang Jung Yun-seok, who is the master artisan of onggi-making designated as Important Intangible Cultural Property No. 96. The artisan explained the value and making process of the onggi at his booth. When foreigners are asked about their favorite Korean food, most of them would answer “bulgogi” and “bibimbap”. The common thing between those popular foods is that they need “jang”, Korean sauces and pastes, as a major ingredient. These things such as soy sauce and red pepper paste are used to season a dish and they are essential in Korean traditional dishes. To make those sauces, an onggi is really necessary as a container. The earthenware has the perfect structure for the preservation and fermentation of foods because of its breathing holes that allow solar heat and radiant heat to ventilate easily. These holes let the air come in and out of the pot, but does not allow water to do so. This ventilation is the key to making Korean sauces and pastes. There is also another reason that our ancestors used the clay pot to contain jang. The pores of the pot wall push out the impurities formed in the inner surface, so it has an excellent storage function and can store for an amazingly long period without decaying. These ventilation, permeability, and storage systems enhance the microbial development and fermentation of Korean food. 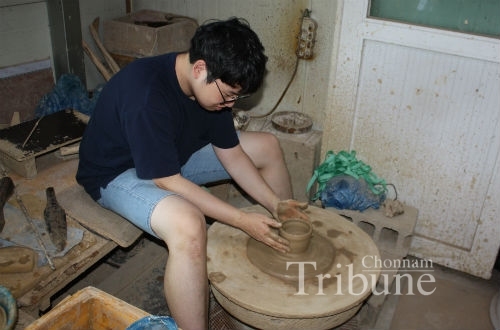 The Tribune reporter visited Jung Yun-seok’s Chilryang Bonghwang Onggi workshop located in Gangjin. Many different shapes and sizes of onggi were everywhere. Looking around the workshop, Jeong Sang-gyun who is one of the successors and the onggijang’s first son explained regional differences in making the earthenware and showed the process of making the basic structure of the clay pottery. I felt the power coming down from his shoulder to his hands, smashing the clay. He built a wall of pottery and it was on top of the wall made before. He kicked a Korean traditional kick wheel while smoothly connecting the walls. After several times of smashing and building them, there was a huge and beautiful onggi. Because of his suggestion, I tried making an onggi. I placed the clay above the turn wheel and put down the rope shaped clay to make a wall. I kicked the turn wheel and tried to make the clay rope into a wall, but I failed due to a lack of basic skills. The successor said that making onggi needs lots of practice and effort. I tried several more times to make a pot. With his help and advice, I could make it much better. 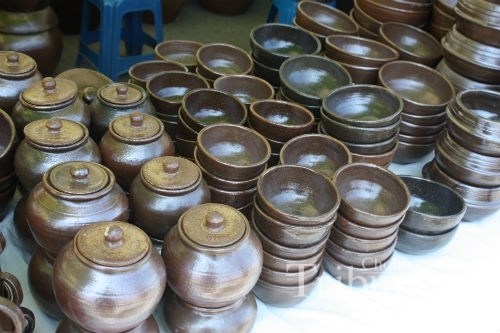 The procedure of making onggi seemed very easy and a bit similar to making other kinds of earthenware. However, while experiencing the making process, this reporter realized that it is different from other ceramic pottery. Especially, going through the preparation step of clay to finishing its basic structure, I started to realize how much effort is needed to make one single pot. The hardship and the time it takes to make this amazing pottery cannot be compared with other simple glass bowls we use in our everyday lives. At this point, the affection and endeavor of the artisans moved my heart. However, many people do not know its value and merits compared to other containers. Therefore, I thought that there should be more support and attention to our own traditional pottery, encouraging artisans to preserve and develop this wonderful earthenware. Before visiting Gangjin, I personally thought all pottery was the same. Now I am proud to be the one who knows how to make traditional Korean earthenware and be thankful to the ancestors who were so wise to have this amazing knowledge. I recommend you share their wisdom and feel it directly on the skin by visiting there. As the old saying “We should review the old and learn the new” says, we truly need to try one more time to review the past to get better things, not just accept the new. I graduated from middle school at the age of 16 because of family circumstances. I did not want to give up studying, so I decided to earn money and study by myself. I went to Seoul alone and worked at an inn for two months, but I realized that there were no prospects. I came back to my hometown this Bonghwang village that was famous for onggi. Then I saw onggi artisans earn more money compared to other workers, so I decided to learn how to make onggi. Q: What are the specialties of onggi? A: Onggi can store foods for a long time thanks to fine pores produced when baking it in a kiln. It also has microorganisms in fermented foods such as kimchi, ”doenjang” (soy bean paste), and ”gochujang” (red pepper paste) which breathe and cause fermentation. It is a container that does not harm our bodies because it is baked with soil obtained from the mountains and lye and does not break easily. Therefore, if you buy an onggi, you will be able to use it permanently. In addition, it is environment-friendly unlike plastic containers, it can easily return to Mother Earth when it is cracked or broken. Q: What do you think about Onggi’s prospects? A: Onggi will not disappear. Someday in the future it will revive. To make Korean sauces and pastes, jang, it is essentially needed. Without it, traditional Korean food cannot exist. Nowadays people use plastic, stainless and glass dishes because they are cheap and easy to use. Koreans will find well-being, organic farming foods for their health or eco-friendly objects to care for the environment. For their health and the environment for the future and the present, Koreans and foreigners will prefer onggi. In addition, people will buy it for ornamental use like ceramics.